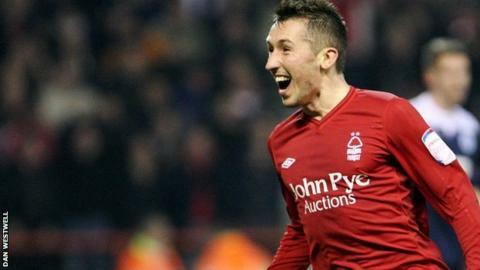 Radoslaw Majewski grabbed his fourth goal in two games as Nottingham Forest continued their resurgence under Billy Davies with a clinical win over 10-man Charlton Athletic. Forest were on top by the time Yann Kermorgant was sent off for kicking out at Greg Halford on 37 minutes. The visitors made the extra man count when Majewski put them ahead after the break with a clever prodded finish. And Henri Lansbury added a second after a mistake by goalkeeper Ben Hamer. The Addicks number one fumbled a tame Billy Sharp strike and Lansbury netted his second goal in two games to ensure Forest moved to within four points of the Championship play-off places thanks to a run of two wins and a draw from three games under Davies. Charlton were second best even before striker Kermorgant saw red. And midfielder Majewski also toe-poked an effort at Hamer while Chris Cohen and Andy Reid blazed shots over. But when Kermorgant aimed an off-the-ball kick at Halford and was dismissed by referee Andrew Madley following talks with his assistant, Charlton never seemed likely to hold out. The Addicks, who have only won four home league games this season, reached the break all square but eight minutes after the restart Reid found Majewski, who managed to beat two defenders and knock the ball past Hamer. Lansbury then had a shot deflected narrowly wide, before he doubled the lead from six yards after Hamer spilled Sharp's strike. Elliott Ward, Majewski, Henderson, Cohen and Reid all went close but Forest, who have not lost a league game having gone ahead this season, did not need the comfort of a third goal in a one-side second half. Charlton Athletic manager Chris Powell: "I have seen it since and it is definitely a red card. It was the red mist for Yann. He does get a lot of knocks and is not always protected but no excuse. "We lose him for three games now and he was immense for us in midweek. I was a bit perplexed at the time as to why the referee consulted the linesman on the far side, which seemed a bit bizarre. "The sending-off made it even harder for us as it was difficult enough when it was 11 v 11 as Forest settled very well and used the ball well. "We really needed to get to half-time and get reorganised but when you are down to 10 it makes it harder." Nottingham Forest manager Billy Davies: "The confidence is growing. We have 12 games to go and we will give it our best shot. "I have said to the players we go to the next match and give it a go again. We know where we are and what we have to do. We know what sort of team we have and we know we have to add to this team." "We have five loanees but the chairman has said we can get more loan players in to try and fulfil the 20 per cent extra potential that has been missing. "There is a great spirit in the squad. A great togetherness, work ethic and the message has got across to individuals. "Their work rate today was superb and we have to continue to do that because nothing has been done but we have had three good performances so far."